This is handbag that is kind of "larger than life"! With it´s sunningly embrodered, shining Poppyflower on the extralong flap, it is such an eyecatcher, i´m sure it will become someones alltime favourite bag! 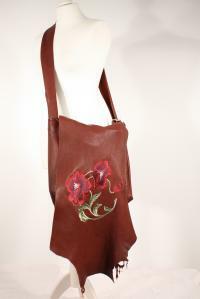 Made from unlined leather, Hight 30cm, wideth 27cm, flap nearly 60cm long!! !